90's vibe, with clean faces and the emphasis on the lips, and with messy, wavy hair. 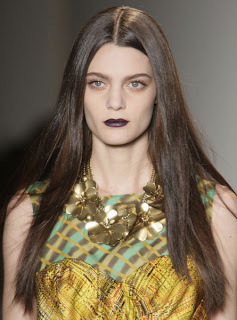 The models showcased dark red or deep purple lips, filled brows, and sculpted cheeks. This look is very pretty and wearable on all skin tones. Just even out skin with foundation or concealer as needed, fill in brows with powder, and apply a taupe or brown shadow all over eyes. Sculpt the cheek bones with a slightly darker foundation or powder, or a taupe-y blush or bronzer swept under the cheek bones. For lips, apply a deep red or eggplant and blot to ensure the color lasts. Very chic! This look is also really pretty, but is much more striking on lighter skin tones. Even out skin with foundation and concealer as needed and set with a translucent powder. Fill in brows and try a shimmery shadow in champagne or gold. Pick a dark purple or wine colored lip liner and fill in lips, paying special attention to having a clean line. Try using an eyeshadow to get the metallic finish. To get this makeup look, follow the foundation application as above, and sweep a light pink blush on the cheekbones and slightly on the apples of the cheeks. Fill the brows and use a dark grey or black liner on the outer edges of the eyes and smudge inward. Follow with dark grey shadow in the crease and slightly on the lid, and finish with two coats of mascara on upper and lower lashes. Apply a pale pink to lips, blending out natural color with concealer if necessary. I LOVE the orange lip on the Max Azria runway. The models all had clean, soft skin and eyes, sleek pulled back hair, and soft brows. The pop of color came from the orange lip, which is a fun new color for fall. Most fall lips are dark or red, as above, so I really like the orange lip here. There are many shades of orange and coral, all of which could mimic the look here. Try tapping lip color into the center of the lip and softening out towards the edges for a soft look.